Summer gardens here in Saskatchewan are abundant with flowers, and these pale blue and lavender delphinium blooms are from a volunteer plant in the one flower bed I have managed to tend this past year. It is a surprise every spring, as having not planted it, I easily forget that such a lovely plant is hiding, dormant between the chives and tulip bulbs all winter. This particular stem of soft petals was broken by a heavy summer downpour during an afternoon thunderstorm. I looked out the kitchen window and saw it drooping heavily, and after the lightning subsided, went outside to see if it could be salvaged. The stalk was torn nearly through, and the flowers were drenched in rain. I cut the spike free, gently shook most of the water off, and put the two foot tall tower of pastel blooms in a vase. The clearing storm provided soft, diffused light and seeing how some tiny waterdrops still clung to the flower petals, I ran inside for my camera. This was a wonderful opportunity to use my macro extension tubes, and the exercise of shooting manually, leaning in and out ever so slightly to perfect the plane of focus, was an enjoyable reminder of the photographic techniques I learned when shooting film decades ago. 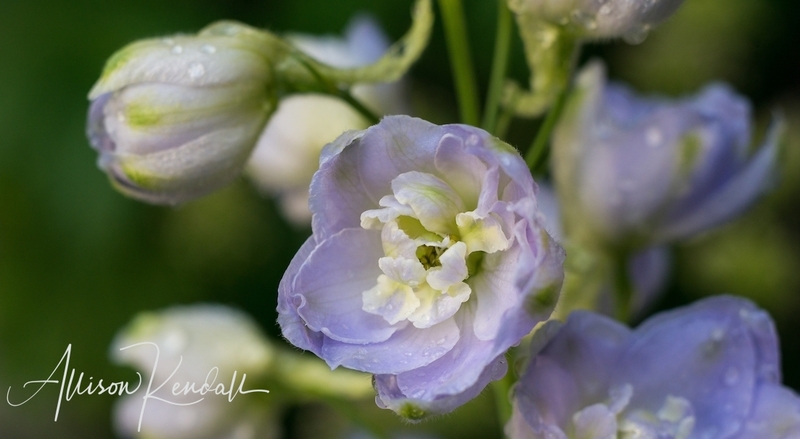 A selection of these lovely summer flowers have been added to my fine art prints gallery titled Bloom and the entire collection of rain-soaked delphinium blossoms can be found in the APK Photography archive gallery Flowers & Plants.